» A Movie Review by Walter Albert: SALLY, IRENE AND MARY (1925). 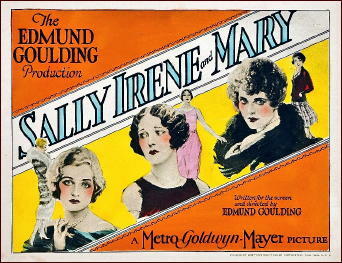 A Movie Review by Walter Albert: SALLY, IRENE AND MARY (1925). SALLY, IRENE AND MARY. MGM, 1925. Constance Bennett, Joan Crawford, Sally O’Neill, William Haines, Henry Kolker, Douglas Gilmore. Based on a play by Eddie Dowling. Director: Edmund Goulding. Shown at Cinecon 39, Hollywood CA, Aug-Sept 2003. I have fond, if vague, memories of the 1938 remake of this silent film that featured Alice Faye, Tony Martin, Fred Allen, Joan Davis, Jimmy Durante, and Gypsy Rose Lee (quite a cast! ), but I had never seen the original film. 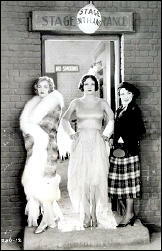 Constance Bennett (Sally), Joan Crawford (Irene), and Sally O’Neill (Mary) are showgirls, with Sally the older and wiser gal who’s seen it all but is happy with her older lover who keeps her in luxury, and Irene and Mary the recent recruits, childhood friends from the same tenement background. The film alternates between the giddy, dangerous after hours parties and the tenement apartments where families fear they are losing their daughters to a sinful show business world. The adventure will end tragically for one of the tenement girls while the other will return to her childhood sweetheart. The scenes in which the showgirls talk and gossip among themselves are striking in their mixture of dreams and occasional rueful incursions of reality. Crawford is the standout, although Bennett is almost as fine in her “mother hen” portrayal. Sounds remarkable, with 3 strong leading ladies backed up by the likes of William Haines and directed by Ed Goulding. Paint me green,Walter…. Ah, le pauvre Dan. I wish that I had a copy of this to send you. Just another of those reviews that remind me that the years of trekking to Columbus, Syracuse and Hollywood were not in vain, giving me the opportunity of viewing films that I would otherwise never have seen.